Who doesn’t love a cozy bowl of creamy, cheesy soup on a cold winter day? 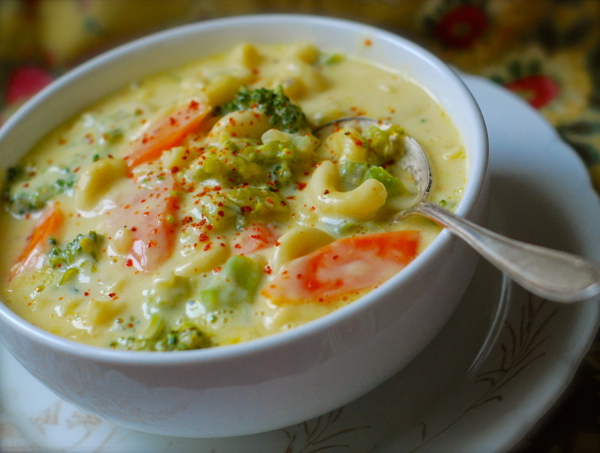 I dreamed up this soup because I was craving creamy veggie soup and mac & cheese at the same time. This soup is the best of both worlds. It’s extremely easy to prepare, and there’s a good chance you have everything you need in your fridge and pantry. If you want to add some cooked, cubed chicken, be my guest. If you don’t have one of the veggies, feel free to double up on what you do have or substitute something different. I love the flavors of carrots and broccoli with sharp cheddar cheese! So good! In a large Dutch oven, cook pasta according to package directions for al dente/firm pasta. Drain well. Transfer to a large mixing bowl. Toss with one of the Tablespoons of butter so the noodles don’t stick together. Cover and set aside. In the same Dutch oven melt the remaining 3 Tablespoons of butter over medium heat. Once melted, add the onion, bell pepper, carrots, salt, and pepper. Cook, stirring occasionally, until veggies are tender, (5 to 6 minutes.) Add flour, cook, stirring constantly, for one minute. Slowly stir in stock, followed by the milk, mustard, garlic powder, and cayenne pepper. Bring to gentle boil and then immediately reduce to a gentle simmer, stirring constantly, until thickened (7 to 8 minutes.) Stir in broccoli (and chicken, if using.) Simmer until broccoli is tender (4 to 6 minutes.) Remove from heat and allow to rest for 1 minute. Add cooked pasta and shredded cheese. Stir until cheese is melted and smooth. Serve.